Senate Minority Leader Franklin Drilon agreed with President Rodrigo Duterte that the next round of peace talks with the communists should be held in the Philippines. "I support the President's decision. The venue of the next round of peace negotiations with the rebel groups should be the Philippines," Drilon said in a statement on Saturday, June 16. He added: "It's about time that we change the venue of peace talks with the National Democratic Front (NDF), and it is about time that it takes place on Philippine soil." Drilon, who once served as a peace process adviser during the Ramos administration, said the change in venue will not affect the peace process. Instead, Drilon said that conducting the talks without an international third party may be able to "accelerate the discussion." "The peace talks have always been held in an international ground but it did not seem to accelerate discussion. Let the real peace talks begin in a local arena. No third party this time," Drilon said. 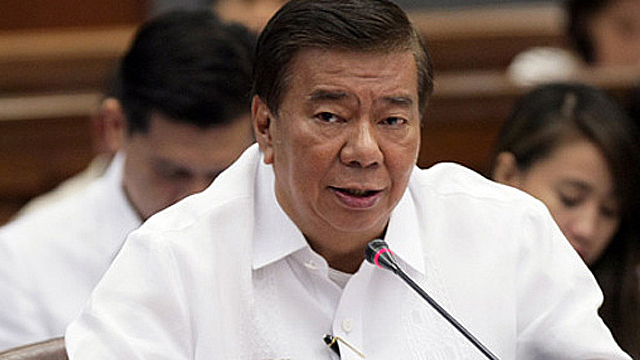 It will also convey a strong message from both parties, Drilon said. It will show the government's sincerity and confidence in both parties, and the communists' recognition of the legitimacy of the Philippine government. "We will never achieve a true and lasting peace if the CPP-NPA-NDF, after a series of peace negotations that took place, would still say they do not recognize the legitimacy of the government," Drilon said. He added: "It is about time that they show they really do. Go to the Philippines and let's talk peace." The next round of talks was supposed to take place on June 28 in Oslo, Norway, but Duterte postponed it to give the military time to assess ceasefire implications. While the military wants to postpone the talks for 3 months, Duterte said it is still possible that the talks will be held in July. Communist Party of the Philippines (CPP) founding chair Jose Maria Sison is not keen on returning to the Philippines without clear legal guarantees, he told the Inquirer in an online interview from the Netherlands. Duterte had been trying to induce Sison to come home with a verbal promise that if nothing is resolved in their meeting in the Philippines, the exiled communist leader can return to the Netherlands "unfettered" and "unbridled."